Change, they say is inevitable. Everything in this world keeps evolving. The same is true of your organization’s relationship with its CRM system. A CRM solution that served your needs two years ago may no longer be effectively doing so today. Whether the cause is the growth of your business, your CRM system is outdated or it never was a good fit to begin with, it may be time to find a new solution. We compiled the following signs from the experts at GetCRM, Nuvem Consulting and FinancesOnline. When you started your business operations, your requirements of your CRM system were limited. However, as you grow as an organization, you need more and more functionalities to keep pace with the competition. You want your CRM system to automate sales processes, keep accurate records of all sales interactions, track productivity and performance, generate task lists, calendars, reminders, and alerts so that your staff can deal with customers more efficiently. If your CRM system does not offer all these functionalities, it can adversely affect your business operations. Many improvements have been made in the user interface and user experience (UX) of new-generation CRM systems. One quality that businesses look for is the user-friendliness. Ease of use is another critical factor. What is the point in buying a CRM system that’s difficult to use? As discussed in our May 2018 blog post, “Best Practices to Increase CRM User Adoption,” buying a CRM system that your team members find frustrating to use is counterproductive. A CRM solution should solve your problem rather than create new ones. The more you grow as an organization, the more flexibility you need. If your CRM solution isn’t flexible, scalable or offers mobile access to all team members, you can’t beat your competitors in areas like efficiency and service speed. As Nuvem Consulting points out, each customer you store in your CRM has their own “profile” or “contact card” with everything there is to know about that customer. Being able to configure the fields at the setup level is crucial so that you can segment demographics and scale that infrastructure whether you have 1,000 contacts or 100,000 contacts. You will also be able to quickly organize existing customers in order to improve customer retention. A CRM system should also easily allow you to scale the number of users; your sales people should be able to access the CRM on the move from the devices of their choice. The main purpose of a CRM system is to facilitate and improve communication between you and your customers. But if this communication starts happening outside your CRM system, it’s time to reevaluate your CRM solution. When users start communicating outside the CRM system, it can have a telling effect on managing and improving the customer experience – which is the mainstay of customer relations management. Remaining in touch with your customers helps you learn more about their preferences and purchasing habits. You can communicate through emails, but it should be a built-in or integrated feature of your CRM system. An effective CRM system should automate just about every aspect of your sales process – including email generation and distribution. If your employees start sending out emails manually, it means your CRM system is not doing its intended job. One vertical that needs a CRM solution the most is your sales department. If your sales staff isn’t willing to use it, your business has wasted money and resources. Our September 2018 blog post, “Why Your Sales Reps Try to Avoid CRM,” explores this issue – and its solutions – in detail. As GetCRM observes, your CRM can feel like an encumbrance when it’s only used to store data. This is compounded when third-party business tools have no interaction with the CRM. If your accounting, HR, ecommerce software, and others don’t communicate with your CRM, you’re greatly limiting its utility. Proper vendor support is essential for the smooth functioning of your CRM system. You not only need it during the implementation stages, but after. If your vendor doesn’t provide adequate training, technical and customer support, you won’t receive the optimum functionality and benefits. You and your team members will also be exasperated in taking the time and effort to address problems and create workarounds on your own instead of being able to contact the vendor (who has probably also built customer support into the pricing). 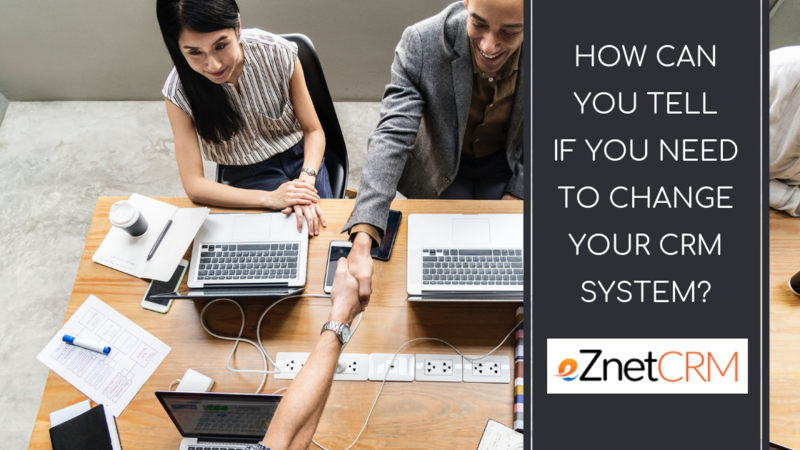 If you’re considering a new CRM system that better suits the needs of your organization, eZnet CRM is a cloud-based system that provides an unparalleled feature set designed to deliver seamless integration with your current business model. Contact us to learn more and get started with a free 30-day trial to be confident that eZnet CRM is the ideal solution for your business.